I love flatwound 1 strings on electric guitars, particularly hollow body jazz guitars. I’ve currently got flat wound strings on three of my guitars, one of which is a solid body. There are many companies selling flat wound guitar strings. How do you choose? I can’t answer which strings you’ll like best but I have gathered data for a large number of brands and models of flat wound guitar strings. I hope this helps. D’Addario is a popular brand and one of my favorite string makers. Their flatwound line of strings are called Chromes. Because of their popularity they are easy to find. Your local music store probably has some. All of the big online musical instrument suppliers carry D’Addario. They are reasonably priced and they have a fair selection of differently gauged sets. John D’Angelico was one of the greatest archtop luthiers of the last century. Discussions between him and D’Addario led to the 80 / 20 Bronze string formulation in the 1930s. He once sold strings made to his specifications. I haven’t discovered definitively whether these were wound in his shop or if he had an OEM arrangement with D’Addario or someone else. However it is clear the new D’Addario company that is currently reproducing guitars based on D’Angelico designs, is essentially a virtual company that specified what they want and have others make it. That isn’t a criticism. It brings these great designs into a price range that we poor mortals can afford. I am not sure if the strings with the D’Angelico name are unique but they are available at a good price. I recently purchased a set but haven’t had a chance to try them yet. DR’s “flat-wound” strings are actually polished rather than flat tape wound strings. These are probably brighter than true flat-wound strings while still reducing finger noise. Fender doesn’t have much of a selection for flatwound strings. Although Gretsch and Guild guitars are now part of FMIC and have often been strung with flatwound strings, Fender guitars are not associated with flatwound strings. I apologize for this entry. It is the only incomplete listing. Galli makes more gauges of flatwound string than listed here. I had not heard of Galli until recently when I found them listed on Musician’s Friend and other sites. They appear to be a well established company only recently expanding their markets. The company was founded in 1890. The first four string sets listed are part of GHS’s Precision Flats series. These are not true flatwound strings but are made with a double winding, producing a smoother finish. Not listed here are GHS Brite Flats. Brite Flats also are not a true flatwound string. These string are precision ground to produce a smooth surface. They use Alloy 52 which is becoming popular among string makers. It is a mixture of 52% nickel and 48% iron. The nickel makes the alloy corrosion resistant while the iron gives it great magnetic properties. The Pat Martino flat wound set is currently not listed on the GHS website but can still be found at online merchants. La Bella claims to have invented flat wound strings in 1940. That alone makes the strings worth consideration. I’ll admit I have never tried them, but I feel now I have to try them – if only for fairness. La Bella also makes an interesting, non-traditional flat wound string that are wound with black nylon tape. Optima Jazz Swing Chrome Flatwound strings are not easily found online. Strings by Mail has them. Pyramid has been making strings since 1850. They are a European company (Germany) and are known for quality strings. They also seem to be among the most expensive strings (along with Thomastik-Infeld, another German string company). You’ll have to decide for yourself if the quality justifies the price. Rotosound are known for their monel flatwound bass string sets. They make a flatwound monel set for guitars as well. Monel is an alloy used by Gibson back in the 1930s. It was popular but difficult to work with. There are few companies currently making strings from monel. S.I.T. makes a stainless steel flatwound string. No choice of gauges. Thomastik-Infeld makes a Jazz Swing series of flat wound strings (JSxyz) and George Benson flat wound strings (GBxyz). I’ve used the JS strings and think they are great but expensive. Are they worth it? I’m not sure. However, the strings last a very long time and feel great. I like them a lot. Newtone Archtop Masters are double wrapped strings, not traditional flat wound strings. As with double wrapped and polished strings from other companies, these are expected to be brighter sounding than traditional flatwound strings while still providing a reduction in finger noise when sliding your finger up or down the string length. All Flat Wound Strings sorted by gauge of 1st and 6th strings. 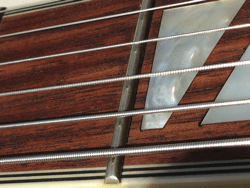 How do you spell Flat Wound Strings? I’ve tried to keep the spelling used by the string maker’s website. Flatwound (one word): is used by D’Addario, D’Angelico, Fender, Galli, GHS, Optima, Pyramid, Rotosound and S.I.T. Flat Wound (two words) is used by La Bella and Thomastik-Infeld. DR strings hyphenates to flat-wound. D’Addario is one of only two companies who make string tensions available. The table presents string diameter in 1000ths of an inch and tension in lbs at standard tuning and scale length. FW: traditional flat wound strings; NT: non-traditional smoother strings due to nylon tape, double wrap or polishing. I think it would be really helpful to indicate which strings are plain steel rather than flat wound. It’s probably a safe bet that most 1st- and 2nd strings listed here aren’t wound at all, but are just unwrapped core wire. You are correct. Unlike round-wound electric guitar strings (or nylon classical strings) where either the first three strings are plain or you have an option of a wound or plain third string, almost all flat-wound strings are wound for the 3rd to 6th strings. Only the 1st two strings are plain. I am not aware of flatwound strings with a plain third (but that doesn’t mean they don’t exist – I just don’t recall them).